Creating and mainstreaming superior food made solely from plants—especially one that cuts into a giant competitor’s profits—can get you sued: that is what Hampton Creek Foods, a vegan food technology company striving to create more sustainable and affordable food, recently learned soon after its eggless mayonnaise Just Mayo landed in national retail chains. Unilever, the owner of Hellmann’s and Best Foods, feeling it could no longer ignore Hampton Creek’s growing success, has filed a lawsuit against the start-up company alleging false advertising and unfair competition. Their central claim? Just Mayo deceives consumers into falsely believing that the eggless mayo product is real mayonnaise, when it is not, since “real mayonnaise” must contain eggs—according to both common dictionary definitions and the Food and Drug Administration’s standard of identity for mayonnaise. The deception, according to Unilever, allegedly caused it to suffer “great and irreparable injury” warranting injunctive relief and significant monetary damages. Unilever also bases its false advertising allegations on Hampton Creek’s “superior taste claims”; Just Mayo, Unilever insists, does not taste better than the Best Foods and Hellmann’s brands of mayonnaise (despite some blind taste tests indicating otherwise), nor does it perform like mayonnaise when heated in sauces (as seemingly refuted in this demonstration). Whether these claims will hold up in court—or tossed out as frivolous—remains to be seen. 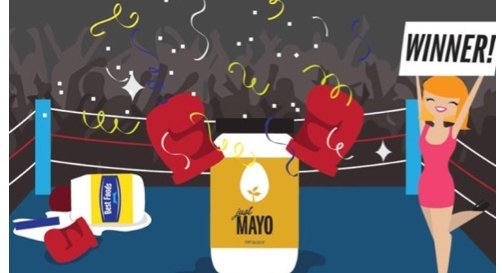 On the legal merits, Hampton Creek counters that since its product is labeled “Mayo,” not “mayonnaise,” it is not violating the FDA’s standard of identity. But some experts say the crux of the case will turn on whether reasonable consumers are likely to be misled or deceived into believing that Just Mayo contains eggs. One important consideration in favor of Hampton Creek is its transparency: the whole point, after all, is to “take the animal out of the equation”—as Hampton Creek’s CEO Josh Tetrick has repeatedly said—and create healthier, more sustainable and cheaper foods made solely from plants. That’s why, in addition to being labeled “Egg-Free,” the Just Mayo product depicts the company’s logo of a pea shoot inside an egg, symbolizing (though perhaps too subtly) Hampton Creek’s mission to make eggs obsolete in favor of plants. Media coverage has also overwhelmingly painted Unilever in a negative light (with egg on its face) while providing free advertising for Hampton Creek. And more tangible repercussions will surely follow: in the latest round of “the mayo wars,” Unilever was caught red-handed doctoring customer reviews to cover up its own deception of marketing non-mayonnaise products (technically “mayonnaise dressing”) as “mayonnaise.” The latest evidence of such deception is quite damning. Given the remarkable backlash and ridicule, much of which could have been anticipated, it’s difficult to comprehend why Unilever (and the company’s advisors and lawyers) thought attacking a highly sympathetic defendant was a smart idea. And yet, this lawsuit has tremendous potential for good, by bringing necessary attention to our broken food system and the devastating harms of animal agriculture—including legally sanctioned animal torture. It might highlight, for instance, the hideous treatment of chickens used for eggs in industrial farming, the ones who supply the eggs in “real mayonnaise,” and exist solely as means for generating profit. Despite the pervasiveness of animal cruelty, most still do not know that the vast majority of egg-laying hens must spend their lives crammed together in battery cages, unable to move more than a few inches or even spread their wings; that they are intentionally mutilated and starved; or that male chicks, shortly after hatching, are discarded typically via suffocation or being ground up alive. Remaining ignorant of these unpleasant truths – and others – may soon be a thing of the past as they are forced into the light.